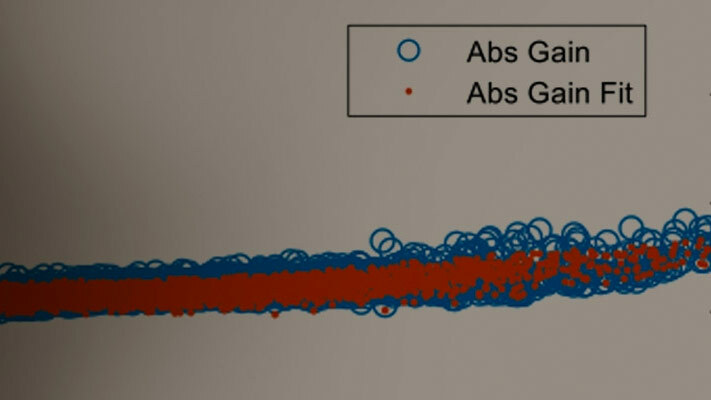 This example shows how to use the RF Blockset™ Circuit Envelope library to test intermodulation distortion of an amplifier using two-carrier envelope analysis. Two Outport blocks that probe the input and output voltages (across shunt resistors) at the carrier frequency. The example model defines variables for block parameters using a callback function. To access model callbacks, select File > Model Properties > Model Properties and click the Callbacks tab in the Model Properties window. Type open_system('simrfV2_power_imd') at the Command Window prompt. 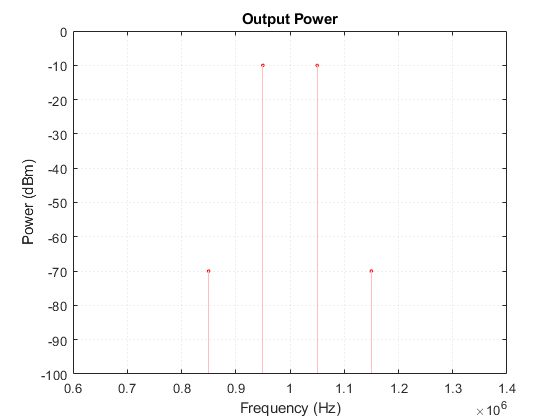 The resulting output power spectrum, labeled 'Output Power', shows third-order intermodulation distortion. The Display block shows the power of the bandpass waveform, which is half of power of the envelope waveform. The spectrum analyzer is set to probe for the Output Power. 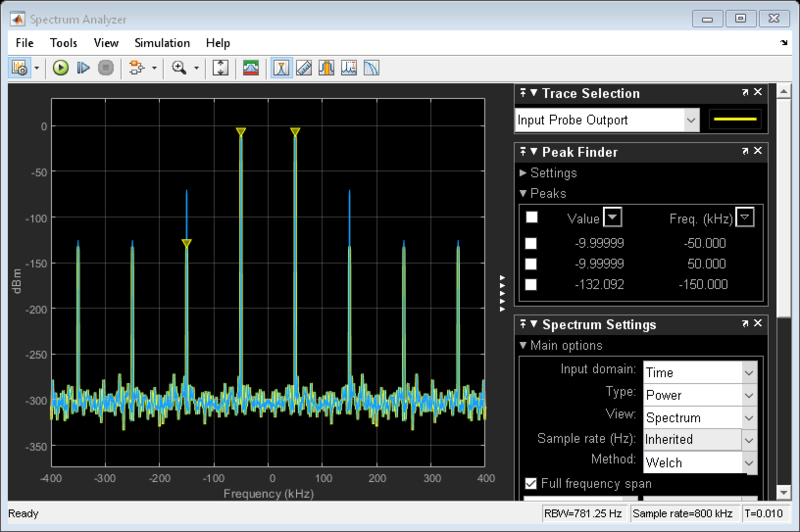 On comparing values, you will see that the spectrum analyzer matches the output power spectrum. 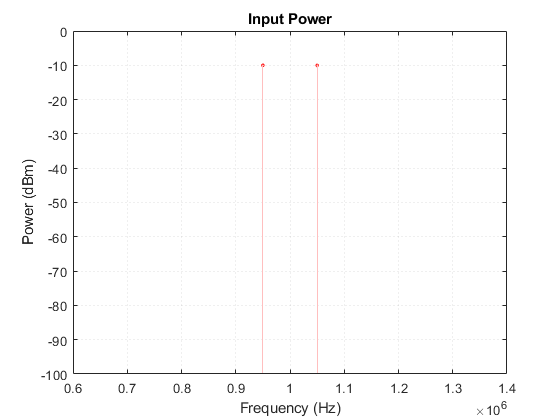 Reduce the power of the input signal by decreasing the value of the Amplitude parameter of the Sine Wave block. Choose f1 and f2, the frequencies of the test tones. 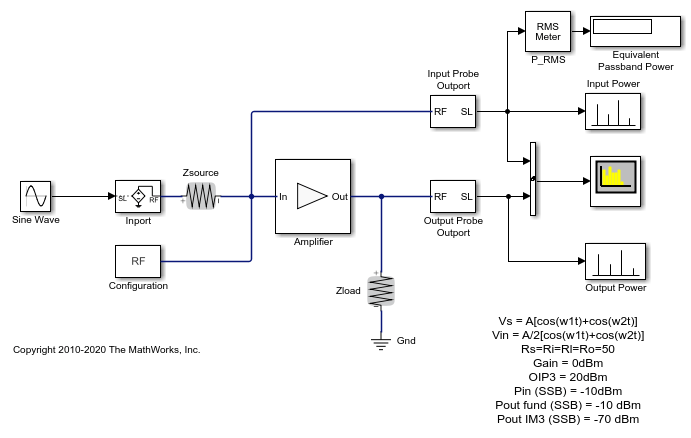 Use a Simulink Sine source and an Inport block to model modulation with frequency (f1-f2)/2 on a carrier with frequency (f1+f2)/2. Alternatively, you can use a Sinusoid block from the RF Blockset Circuit Envelope library to specify both a modulation and a carrier simultaneously. Specify (f1+f2)/2 as one of your carrier frequencies in the Configuration block dialog. Use an Outport block to probe the distorted signal. Cripps, Steve C. RF Power Amplifiers for Wireless Communications. Artech House, Inc., 2006.